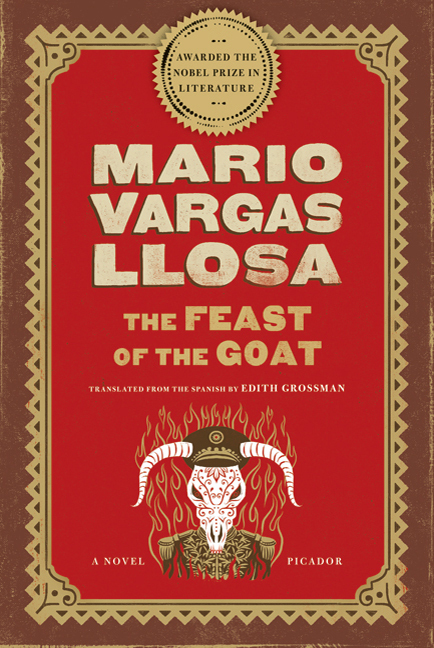 This month’s book club selection was The Feast of the Goat by Mario Vargas Llosa. And what a book it is. Every so often , book club delivers a book that is bolt out of the blue and this book is certainly that. In fact we’ve done quite well recently with books that I really didn’t have much of an idea about that turn into classic book club books. A classic book club book for me is a controversial read – it might be easy to read or a complete nightmare to finish in the time and the result is a great discussion on the night. Goat did just that. Although we were depleted due to illness and we had another guest member for the evening – resulting in a new dynamic in the group – it resulted in a classic discussion. The book itself centres around the assassination of The Dominican Republic dictator Trujillo in 1961 and weaves around this momentous act a tangled web of characters and plot lines. Llosa employs an intriguing narrative ploy flitting between tenses which builds, sustains and at times neutralises the tension he cleverly creates, making it almost impossible for the reader to not turn the page. This author is another clever exponent of the ‘what is fact and what is fiction’ brigade, carefully weaving complex fact and characterisation amidst what is clearly a factual account of the bloody episode in South American history. In fact when I finished the book I couldn’t wait to find out more about what actually happened in the Dominican Republic, such was its grip on me. The book is unflinching in its portrayal of the brutality of the regime and there is a genuinely shocking secret at the heart of the story that’s possible to see coming but even suspecting this might be the case doesn’t dissipate the power of it. It’s not often I actually gasp reading a book but this was one of those occasions. Special mention has to go to Edith Grossman, who translated the book from the original Spanish. There wasn’t a single moment in the book where the translation let it down, unlike other books we’ve read that were translated. In fact the language was incredible telling the story in a vivid and appropriately lucid way. I scored this book 9/10 and in fact it scored highly around the table too with 9, 9, 8 and 7 respectively. I found it a powerful and compulsive read and I’d highly recommend it. I still have my copy – let me know if you’d like to borrow it.